The Earth is certainly the most familiar planet, though it has only been a few hundred years since we fully realized it was a planet. We begin our study of objects in the Solar System with the Earth because it is interesting in its own right, and it provides a test of many observing techniques that we wish to use for other objects in the Solar System. The Earth is, at least by human standards, a beautiful planet, as the following images indicate. Here is an interactive viewer that displays either a map of the Earth showing the day and night regions at this moment, or a view of the Earth from the Sun, the Moon, the night side of the Earth, above any location on the planet specified by latitude, longitude and altitude, from a satellite in Earth orbit, or above various cities around the globe (Credit: John Walker). Here is the NASA Earth from Space image gallery, where you can find many images of the Earth taken from space. The study of the Earth's surface and interior is the domain of geology. We know little directly about the interior of the Earth. Most of our information in that regard has come from seismic waves, which are vibrations in the body of the Earth. There are two general categories of seismic waves. P-waves, which are longitudinal pressure waves and can propagate in both solids and liquids. Accumulated and detailed seismic studies, coupled with theoretical speculation, suggests the interior structure shown schematically on the left (the figure is not to scale). 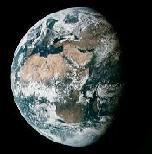 The Earth is believed to have a solid inner core, made mostly of iron and nickel. This is surrounded by a liquid outer core, also mostly iron and nickel. The diameter of the core is estimated to be 7000 km, compared with a 12,700 km diameter for the entire planet. The crust is only a few tens of kilometers thick. The region between the core and the crust is called the mantle. The upper part of the mantle and the crust together are called the lithosphere. Sitting just below the lithosphere is a region of plastic consistency called the aesthenosphere. We shall have more to say about the lithosphere and aesthenosphere shortly. The Earth did not have the interior structure described in the preceding section when it was formed. The geological process by which the Earth came to have its present interior structure is called differentiation, and is illustrated in the following figure. Decay of radioactive material trapped in the body of the Earth. While the Earth was molten, gravity acted to concentrate more dense material near the center and less dense material nearer the surface. When the Earth solidified again (except for the liquid outer core) it was left with a layered structure with more dense material like iron and nickel near the center and less dense rocks nearer the surface. As the outer layers cooled and solidified, large cracks developed because of thermal stress, leaving the lithosphere broken up into large blocks or plates. As we shall see, this has enormous implications for the subsequent geological history of the Earth because it produces conditions favorable for plate tectonics. One of the crucial questions that we will have of all solid bodies in the Solar System is whether they have ever been differentiated. It is now uniformly agreed that the crustal plates of the Earth are in horizontal motion. This is called continental drift colloquially, and plate tectonics (see also this summary) in technically more precise language. This is newly won knowledge. Although the idea has been around for almost a century, it was not generally accepted (indeed, was often considered crackpot) until the last few decades. Animation of the drift of the continental plates over the last 750 million years. Click the "stop" button on your browser to stop the animation at a particular time. Restart the animation by hitting the "reload" button on your browser. 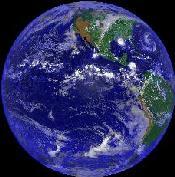 We now believe that the surface of the Earth looked very different 200 million years ago from its present appearance. In particular, the continents have changed because they sit on blocks of the lithosphere that are in horizontal motion with respect to each other, and indeed they continue to change because the horizontal motion continues. The following figure illustrates. The present continents separated from two supercontinents called Laurasia and Gondwanaland through this process of plate tectonics. The two supercontinents may have once been united in a single supercontinent called Pangaea, though this is less certain. What is the origin of plate tectonics? The continents drift slowly (the timescale for substantial change is 10-100 million years), but that they drift at all is remarkable. The following figure illustrates the structure of the first 100-200 kilometers of the Earth's interior, and provides an answer to this question. The crust is thin, varying from a few tens of kilometers thick beneath the continents to to less than 10 km thick beneath the many of the oceans. The crust and upper mantle together constitute the lithosphere, which is typically 50-100 km thick and is broken into large plates (not illustrated). These plates sit on the aesthenosphere. The aesthenosphere is kept plastic (deformable) largely through heat generated by radioactive decay. The material that is decaying is primarily radioactive isotopes of light elements like aluminum and magnesium. This heat source is small on an absolute scale (the corresponding heat flow at the surface out of the Earth is only about 1/6000 of the Solar energy falling on the surface). Nevertheless, because of the insulating properties of the Earth's rocks this is sufficient to keep the aesthenosphere plastic in consistency. Very slow convection currents flow in this plastic layer, and these currents provide horizontal forces on the plates of the lithosphere much as convection in a pan of boiling water causes a piece of cork on the surface of the water to be pushed sideways (following figure). Of course, the timescale for convection in the pan is seconds and for plate tectonics is 10-100 million years, but the principles are similar. Thus, we see that differentiation is crucial to plate tectonics on the Earth, because it is responsible for producing an interior that can support tectonic motion. The shapes of many continents are such that they look like they are separated pieces of a jig-saw puzzle. For example, look in the adjacent map at the shape of the east coast of North and South Americal relative to the shape of the west coast of Africa and Europe. Many fossil comparisons along the edges of continents that look like they fit together suggest species similarities that would only make sense if the two continents were joined at some point in the past. There is a large amount of seismic, volcanic, and geothermal activity along the conjectured plate boundaries. This is shown clearly below in the figure labeled "Crustal plate boundaries" where the epicenters of earthquakes above Richter magnitude 5.0 are plotted for a 10-year period. The concentration is striking, and indeed this plot serves to define the plate boundaries extremely well. There are ridges, such as the Mid-Atlantic Ridge (see figures above and below) where plates are separating that are produced by lava welling up from between the plates as they pull apart. Likewise, there are mountain ranges being formed where plates are pushing against each other (e.g., the Himalayas, which are still growing). Plate tectonic motion, which may be only centimeters per century, is now being studied by careful laser ranging techniques that are capable of detecting such small motions. If the crustal plates are pulling apart at boundaries like the Mid-Atlantic Ridge (see the line of earthquake epicenters down the center of the Atlantic in the preceding figure), the sea floor near these ridges should be very young geologically, since it is formed of material upwelling from the interior. This is indeed the case, as the following figure shows. This figure displays the estimated age of sea floor crustal plates with red the youngest and blue the oldest (more information). Click on the image for a larger one with legible writing (but it is a 385 kB file). One can see clearly that material near the crustal boundaries is very young geologically. Past and future consequences of plate tectonics for the Earth's surface are enormous. The Appalachian Mountains were formed from wrinkling of the Earth's surface produced by the collision of the North American and African plates. The seismic and volcanic activity of the West Coast of the United States (for example, the San Andreas Fault) is produced by the grinding of the Pacific and North American Plates against each other. Indeed, the entire "ring of fire" around the Pacific, corresponding to regions of high volcanic and seismic activity, is caused primarly by the motion of the Pacific Plate. The Dead Sea in Israel is part of a rift system produced by plates that are pulling apart in that region. The Himalayan Mountains were formed (indeed are still growing) as a result of the Indian subplate burrowing under the Eurasian plate and raising its edge. Here are links to animations of the motion of continental plates for the last 750 million years. Portions of California will separate from the rest of North America. The Italian "boot" will disappear. Australia will become linked to Asia. Africa will separate from the Near East. As a consequence of plate tectonics (supplemented by wind and water erosion), we live on the surface of a geologically active planet that has obliterated most of its early geological history. The present atmosphere of the Earth is probably not its original atmosphere. Our current atmosphere is what chemists would call an oxidizing atmosphere, while the original atmosphere was what chemists would call a reducing atmosphere. In particular, it probably did not contain oxygen. The original atmosphere may have been similar to the composition of the solar nebula and close to the present composition of the Gas Giant planets, though this depends on the details of how the planets condensed from the solar nebula. That atmosphere was lost to space, and replaced by compounds outgassed from the crust or (in some more recent theories) much of the atmosphere may have come instead from the impacts of comets and other planetesimals rich in volatile materials. The oxygen so characteristic of our atmosphere was almost all produced by plants (cyanobacteria or, more colloquially, blue-green algae). Thus, the present composition of the atmosphere is 79% nitrogen, 20% oxygen, and 1% other gases. The atmosphere of the Earth may be divided into several distinct layers, as the following figure indicates. The troposphere is where all weather takes place; it is the region of rising and falling packets of air. The air pressure at the top of the troposphere is only 10% of that at sea level (0.1 atmospheres). There is a thin buffer zone between the troposphere and the next layer called the tropopause. Above the troposphere is the stratosphere, where air flow is mostly horizontal. The thin ozone layer in the upper stratosphere has a high concentration of ozone, a particularly reactive form of oxygen. This layer is primarily responsible for absorbing the ultraviolet radiation from the Sun. The formation of this layer is a delicate matter, since only when oxygen is produced in the atmosphere can an ozone layer form and prevent an intense flux of ultraviolet radiation from reaching the surface, where it is quite hazardous to the evolution of life. There is considerable recent concern that manmade flourocarbon compounds may be depleting the ozone layer, with dire future consequences for life on the Earth. 1. The year 1990 (upper image), which was a period of high solar activity with many (150) sunspots. 2. The year 1996 (lower image), which was a period of low solar activity with few (10) sunspots. The plots show electron density contours, which are an indication of the amount of ionization in the atmosphere. Yellows and reds indicate larger ionization and blues and greens indicate smaller ionization. Notice the substantial differences in these two animations, with much stronger atmospheric ionization in the upper image (the active Sun of 1990) than the lower image (the quiet Sun of 1996). The adjacent images are based on these electron density contour maps of the ionosphere for months in the year 1957 to the present. Additional animations may be found in this NOAA directory. Not only does the Earth have a complex atmosphere, but that atmosphere has complicated motion and nontrivial behavior. We Earthlings call this weather in the short term and climate over the longer term. The following images illustrate some of the complex patterns that develop in Earth's atmosphere. Left: GOES-7 image of weather patterns in the Americas and Eastern Pacific. 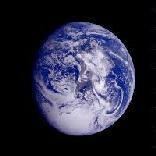 The Earth is a spinning globe where a point at the equator is travelling at around 1100 km/hour, but a point at the poles is not moved by the rotation. This fact means that projectiles moving across the Earth's surface are subject to Coriolis forces that cause apparent deflection of the motion. The following diagram illustrates the effect of Coriolis forces in the Northern and Southern hemispheres. Since winds are just molecules of air, they are also subject to Coriolis forces. Winds are basically driven by Solar heating. As the adjacent (highly idealized) image indicates, Solar heating on the Earth has the effect of producing three major convection zones in each hemisphere. If solar heating were the only thing influencing the weather, we would then expect the prevailing winds along the Earth's surface to either be from the North or the South, depending on the latitude. However, the Coriolis force deflects these wind flows to the right in the Northern hemisphere and to the left in the Southern hemisphere. This produces the prevailing surface winds illustrated in the adjacent figure. For example, between 30 degrees and 60 degrees North latitude the solar convection pattern would produce a prevailing surface wind from the South. However, the Coriolis force deflects this flow to the right and the prevailing winds at these latitudes are more from the West and Southwest. They are called the prevailing Westerlies. The adjacent animation shows GOES-8 weather satellite images over a 72-hour period from Dec. 29, 1996, through Jan. 1, 1997. This is a geosynchrous satellite, which means that it orbits the Earth with the same period as the Earth's rotation and therefore appears to be essentially motionless over a fixed position on the Earth's surface. For GOES-8 this fixed position looks down on North and South America. In these composite images red indicates visible light (reflected sunlight), green indicates the 11 micron IR channel (thermal emission), and blue indicates the 3.9 micron channel (thermal + sunlight). At night the images are blue and green. The three periods of daylight in this 72 hour sequence are clearly visible as red-orange regions moving from East to West (right to left). In the IR channels, the natural intensity pattern has been inverted: warmer is darker, so that cool cloudtops stand out brightly. One can see clearly the pronounced cloud flows associated with the strong westerlies at mid-latitudes in each hemisphere. (This is taken in Northern hemisphere Winter, so the heavier cloud cover in that hemisphere is not surprising.) Less obvious are the easterly trade winds and the polar easterlies, though one can see vestiges of each if one looks carefully. Also apparent are the swirling motions associated with frontal systems. These are particularly pronounced at the boundaries between the mid-latitude westerly and polar wind flows in each hemisphere. Here is a similar weather animation (1.49 MB animated GIF) using GOES-8/9 IR images for North America over a 2 day period from December 31, 1996 through January 1, 1997. The large weather systems that move ashore from the Pacific in this animation produced catastrophic flooding in California, Oregon, and Washington in early January, 1997. The swirling motions evident in the preceding animations are consequences of frontal systems anchored to high and low pressure systems, which are also called anticyclones and cyclones, respectively. The wind flow around high pressure (anticyclonic) systems is clockwise in the Northern hemisphere and counterclockwise in the Southern hemisphere. The corresponding flow around low pressure (cyclonic) systems is counterclockwise in the Northern hemisphere and clockwise in the Southern hemisphere. This is a consequence of the Coriolis force, as illustrated for the Northern hemisphere in the following figure. Here is a pronounced example of a cyclone: a movie of Hurricane Andrew (653 kB). This animation is a loop of infrared satellite images showing the path of Hurricane Andrew across Florida and into Louisiana from Sunday, August 23 through Thursday, August 27, 1992 (Credit: Nathan Gasser). The Earth has a substantial magnetic field, a fact of some historical importance because of the role of the magnetic compass in exploration of the planet. The field lines defining the structure of the magnetic field are similar to those of a simple bar magnet, as illustrated in the following figure. It is well known that the axis of the magnetic field is tipped with respect to the rotation axis of the Earth. Thus, true north (defined by the direction to the north rotational pole) does not coincide with magnetic north (defined by the direction to the north magnetic pole) and compass directions must be corrected by fixed amounts at given points on the surface of the Earth to yield true directions. A fundamental property of magnetic fields is that they exert forces on moving electrical charges. Thus, a magnetic field can trap charged particles such as electrons and protons as they are forced to execute a spiraling motion back and forth along the field lines. As illustrated in the adjacent figure, the charged particles are reflected at "mirror points" where the field lines come close together and the spirals tighten. One of the first fruits of early space exploration was the discovery in the late 1950s that the Earth is surrounded by two regions of particularly high concentration of charged particles called the Van Allen radiation belts. The inner and outer Van Allen belts are illustrated in the top figure. The primary source of these charged particles is the stream of particles emanating from the Sun that we call the solar wind. As we shall see in a subsequent section, the charged particles trapped in the Earth's magnetic field are responsible for the aurora (Northern and Southern Lights). Magnetic fields are produced by the motion of electrical charges. For example, the magnetic field of a bar magnet results from the motion of negatively charged electrons in the magnet. The origin of the Earth's magnetic field is not completely understood, but is thought to be associated with electrical currents produced by the coupling of convective effects and rotation in the spinning liquid metallic outer core of iron and nickel. This mechanism is termed the dynamo effect. Rocks that are formed from the molten state contain indicators of the magnetic field at the time of their solidification. The study of such "magnetic fossils" indicates that the Earth's magnetic field reverses itself every million years or so (the north and south magnetic poles switch). This is but one detail of the magnetic field that is not well understood. The solar wind mentioned above is a stream of ionized gases that blows outward from the Sun at about 400 km/second and that varies in intensity with the amount of surface activity on the Sun. The Earth's magnetic field shields it from much of the solar wind. When the solar wind encounters Earth's magnetic field it is deflected like water around the bow of a ship, as illustrated in the adjacent image (Source). The imaginary surface at which the solar wind is first deflected is called the bow shock. The corresponding region of space sitting behind the bow shock and surrounding the Earth is termed the magnetosphere; it represents a region of space dominated by the Earth's magnetic field in the sense that it largely prevents the solar wind from entering. However, some high energy charged particles from the solar wind leak into the magnetosphere and are the source of the charged particles trapped in the Van Allen belts. The aurora, or northern and southern lights, are often visible from the surface of the Earth at high northern or southern latitudes. Auroras typically appear as luminous bands or streamers that can extend to altitudes of 200 miles (well into the ionosphere). The following figures show three examples of the often spectacular visible light display associated with auroras. Here is another image of the southern aurora taken from the Space Shuttle. The aurora changes with time, often looking like moving curtains of light. Here are some MPEG and QuickTime film clips that illustrate the time dependence of the auroral display. Auroras are caused by high energy particles from the solar wind that are trapped in the Earth's magnetic field. As these particles spiral back and forth along the magnetic field lines, they come down into the atmosphere near the north and south magnetic poles where the magnetic field lines disappear into the body of the Earth. The delicate colors are caused by energetic electrons colliding with oxygen and nitrogen molecules in the atmosphere. This excites the molecules, and when they decay from the excited states they emit the light that we see in the aurora. The collisions of trapped charged particles with atmospheric molecules causes spectacular effects in the visible spectrum, but these excited molecules can also emit radiation in other wavelength bands. The following figures show aurora imaged in the ultraviolet (UV) and X-ray regions of the spectrum. These images were obtained by the NASA Polar Satellite. The X-ray image represents the first global photograph of an aurora in the X-ray spectrum. As we launch our exploration of the rest of the Solar System, it is useful to recall what the Earth looks like using the various imaging techniques that we may wish to apply to distant planets and moons. We have seen a number of images of Earth in visible light, but mostly at large scale from a great distance. Here are two images from space of smaller objects on the Earth that we will be interested in looking for on other planets and moons: a canyon system, and an active volcano. We shall find canyon systems and active volcanoes on other objects in the Solar System to are not too different from these images. There is one aspect of the Earth's appearance that we do not expect to be repeated in the near future for other objects in the Solar System: at night the artificial light associated with human civilization is very visible from space. The following image shows the appearance of the United States at night as observed from a composite of many satellite passes. The major source of light is from cities, but by looking carefully you can even see things like lights scattered in the Gulf of Mexico south of Louisiana that are from oil platforms . The photograph is from Defense Meteorological Satellite Program (DMSP) images. Because our eyes are sensitive to visible light, our prejudice is to view things at those wavelengths. However, we now have instruments at our disposal that permit observations in many wasy other than the visible light region of the electromagnetic spectrum. These often offer considerable advantage; for example radar cuts through the ever-present thick cloud cover to give us images the surface of Venus that we could not obtain at visible wavelengths. 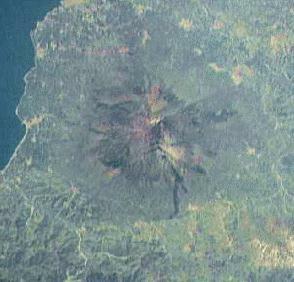 The adjacent images show a comparison of the Mt. Everest region (border of Nepal and Tibet). The top image was taken through thick cloud cover with synthetic aperture radar on the space shuttle Endeavor; The bottom figure is an optical image of the same region taken from Endeavor . 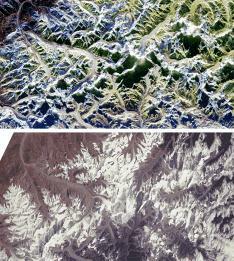 One can see many of the same features in the two photographs (the photographs were taken at different times of the year, so they have different snow covers). The curving and branching features are glaciers. The radar technique used is sensitive to characteristics of the glacier surfaces such as the ice roughness and water content. Thus the glaciers show a variety of colors in the radar image but are a rather featureless gray or white in the optical photograph. We have seen in the preceding sections examples of imaging the Earth in the infrared, ultraviolet, and X-ray regions of the spectrum. Here we show additional examples of IR images, and a more exotic technique combining magnetic and gravitational data that can even locate objects beneath the surface of the planet. 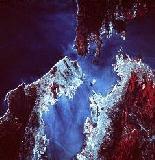 The left figure shows the San Francisco Bay area imaged from space in the infrared (IR). Click on the image for a larger version revealing quite fine details such as bridges and highways. The middle figure shows a composite of local gravity and magnetic field variation data to image a 112-mile wide relic meteor crater in Yucatan that presently lies below several hundred meters of sedimentary rock. This crater, called Chicxulub, is famous because it is the leading candidate for the site of the asteroid impact that is thought to have killed the dinosaurs 65 million years ago in the K-T extinction . The right image shows a GOES-8 weather satellite image in the 6.7 micron IR channel that is sensitive to the distribution of water vapor in Earth's atmosphere. The imager on this satellite records radiation emitted by water vapor in the upper troposphere. Regions with high concentrations of water vapor are bright, while dark spots signal lower water vapor concentrations. Infrared radiation is basically radiant heat. Therefore, IR detected from satellites can be used to determine the temperature of objects. The following image shows a color-coded map constructed from a composite of satellite data and surface observations giving surface temperatures on the Earth. Here is a link to the Current sea surface temperatures (updated daily).